If you haven’t already, get the fall accumulation of leaves and debris cleaned out of the gutters. All you need is a ladder, trowel, and bucket. Make sure your ladder is firmly set. Place the trowel in the bucket then up you go. Scrape out the debris with the trowel and then put it in the bucket. Cleaning the gutters is not enough. Make sure downspouts are also cleared. Using a hose, run water gently down the downspouts. You don’t need Niagara Falls. Gutters and downspouts are more fragile than house pipes so treat them gently. While the water is flowing down, check to see if it is flowing evenly through the end of the downspout. If it isn’t flowing freely or if it is backing back up into the gutter above, clogged downspouts will need to be cleaned. Use an unbent close hanger to “gently” push it up from the base of the downspout or down from the top of the downspout where it meets with the gutter. If the hanger doesn’t reach the blockage, use a plumbers snake then “gently” push against the clog to work it loose. “Gently” flush the downspout clean with the water from the hose. Install gutter guards. This will save you time next year when it gutter cleaning time comes around. 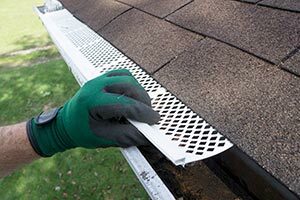 Gutter guard mesh starts for as little as $3 a roll. Find them at a local hardware store. Use shears to cut the mesh. While wearing gloves, start at the end of the gutter. Tuck the mesh in and unroll and tuck so that the mesh is snug in the gutter as well as covering it completely. Overlay mesh at the end of the roll but not the end of the gutter. Cut the mesh at the end of the gutter or at corners. At the gutter corners, overlay mesh, complete covering the corner then at the end of the gutter tuck the end of the mesh down leaving no openings for leaves and sticks to get through. While cleaning the gutters, run water along them and watch for leaks. Seal any leaking joints. Some caulking from your local hardware store will do. You’ve been running water through the gutters to flush them clean and check for leaks. You’ve also run water through the downspouts to flush them clean. The gutter and downspout runoff should be moving away from the house. Check to see that water is being guided away from the house. Use curved sections called diverters at the end of the downspouts. While splash blocks and gutter extensions can work, consider using a popup gutter. Gutters drain into pipes that run under the ground, away from the house. Make sure the pipe is leading downhill toward a drainage area like a culvert or road. You don’t want it to drain back toward the house. The end of the pipe resurfaces with a popup drain. Water pressure from draining water “pops up” the drain, releasing away from your foundation. Since the drain is at ground level, it is low enough to not be harmed by mowers. Foundations protected from gutter and downspout runoff tend to have fewer problems with heaving and sinking. Have additional problems with pooling water around a home foundation? Give us a call, 214-467-9700.